Here at Rope Services Direct we manufacture, stock and supply a huge selection of galvanized wire rope suitable for a wide range of applications. Our 6×19 fibre core galvanized steel wire rope has a central fibre core giving it an extra degree flexibility over its equivalent 7×19 construction with wire strand rope core. The 6×19 fibre core galvanized steel wire rope contains 6 strands of zinc plated steel wire. Each strand is made up of 19 filaments which surrounds the ropes central fibre core helping to make a smoother and more flexible wire rope. It is suitable for all manner of applications including security cables, guardrails, fencing and garage/industrial door cables. The 6×19 fibre core galvanized steel wire rope construction of wire rope offers a good combination of flexibility and wear resistance. Its larger outer wires also offer excellent resistance to abrasion and crushing. Due to its versatility, this rope is suitable for a diverse range of machinery and equipment. However, its resistance to fatigue is not as good as 6×36 galvanized fibre core wire rope. We have this steel rope available in diameters from 3mm-20mm, the 6×19 wire-rope is very flexible due to its fibre rope core. This type of rope is most often used for more common tasks such as:- garage door cables, control cables, gym equipment, wind turbines and W.R slings etc. 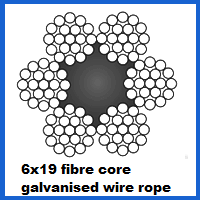 Do you require our 6×19 fibre core galvanized steel wire rope construction? If you’re seeking a multi-purpose, flexible wire rope that is suited to applications demanding a more versatile construction of rope then our 6 x 19 fibre core galvanized steel wire rope is the perfect solution. If you would like any further information on this wire in particular, or any of our other products, please contact us via our website or simply give us a call on 01384 78004. 6x19 Fibre Core Galvanized Steel Wire Rope Overall rating: 5 out of 5 based on 6 reviews.